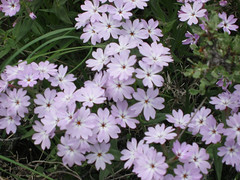 Widespread throughout the Sage Hills, long-leaf phlox presents a brilliant display of condensed pink or white flowers. The predominant flower color is pink but may vary to blue, lilac-purple, or white. The flower is distinctively five-lobed. This plant has a highly variable growth form in that it can be sprawling and climbing over sagebrush, or a compact low mound four to sixteen inches tall. The leaves are numerous, narrow, unnotched, and often sharp-pointed, and, as the name suggests, long relative to the plant -- a half inch up to three inches. Phlox has a deep taproot.